Click on Read More below for results of Draw 2 held earlier this week. Draw No 3 takes place on Tuesday 12th July. 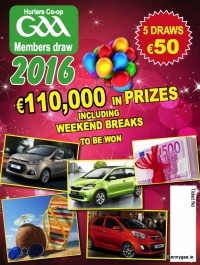 The Fifth and Final Draw took plac e in Piltown last evening with 7 top prizes of €1000 up for grabs. Kilkenny GAA would again like to thank all those who supported this draw in 2015 - purchasers, sellers, Club Organisers etc. The draw is probably the biggest fund-raiser for many of our clubs and provides very important funding for the county also. James Stephens GAA Club were the big winners in the 4th Hurlers Co-Op Draw which took place in Piltown on Tuesday evening. The city club had nine winners in the latest draw including the top prize of a car which went to Claire O Dwyer of Cashel Downs. They also secured the 4th prize of a Monart Hotel Spa Break when Padraig Lawlor's name of the Gourmet Store was drawn. 2nd prize of €2500 holiday went to Lauren c/o Eamon Brophy in Spinks Club while the 3rd prize of a break at Castlemartyr Resort went to James Culleton of Piltown(Mooncoin Club). 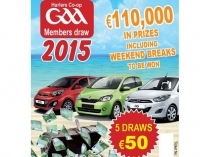 The special club prize of €1000 went to Mooncoin Club. Next draw takes place on Tuesday 4th August. Click on Read More below for full list of winners. The 2015 edition of the Hurler's Co-Op Draw was launched in Nowlan Park recently and draw tickets are now available from Club and County Board Officials right around the county. Now in its 34th year it is the main fund-raising activity for many of our clubs and many of the facilities on view around the county can be attributed to the success of the Draw. Click on Read More below for full details. The first draw takes place on Tusday 9th June and will continue every two weeks with the fifth and final draw on Tuesday 4th August. Draw ticket can also be purchased on-line by clicking on the Hurlers Co-Op Draw icon on the right hand side of this home page. 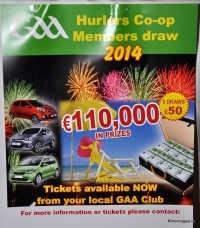 The 5th and Final Draw in this year's Hurlers Co-Op Draw was held last evening. Click HERE for full results. The Draw continues to be the main fund-raiser for many of our clubs and Kilkenny GAA is hugely grateful to all those who both sold and purchased tickets and continue to support us year on year.